him exploring the wreckage of the Saratoga. Many of the most famous ships involved with U.S. testing of atomic weapons at Bikini Atoll after World War II were sacrificed in the experiment. American, Japanese and German aircraft carriers, battleships, cruisers, destroyers and submarines went to the bottom of the atoll's lagoon or were reduced to radioactive scrap. What: Talk by author and underwater archaeologist James Delgado on the "Operation Crossroads" atomic bomb tests, which were conducted by the U.S. government at Bikini Atoll in 1946. When: Book signing, 6-7 p.m.; one-hour slide lecture followed by a discussion session and more book signing from 7-9 p.m. It was more than three decades before historians dared to dive among the shattered hulks. One of the leaders in early expeditions for the National Park Service was James Delgado, now head of the Vancouver Maritime Museum in British Columbia. 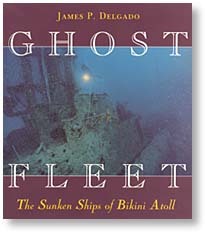 Delgado's discoveries are detailed in his book "Ghost Fleet: The Sunken Ships of Bikini Atoll." Tomorrow, Delgado will be the guest at a book signing and slide lecture on recent discoveries at Bikini Atoll at Bowfin Park, the latest in a series of public talks at the submarine museum next door to the Arizona Memorial Visitor Center. Delgado recently returned to Bikini with an underwater archaeology team from the Discovery Channel. 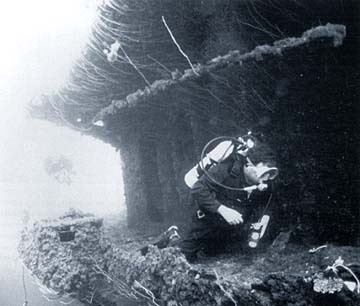 "I'll be talking about what it's like to dive on the sunken fleet down there," said Delgado, "Including the battleship Nagato where the Pearl Harbor attack was planned; the battleship Arkansas, a near sister of Arizona; the carrier Saratoga; the submarines Pilotfish and Apogon; and the destroyer Anderson. "Anderson's wreck was only recently discovered. I've got some great new photos of her on the bottom. She participated in nearly every major campaign in the Pacific -- Guadalcanal, Tarawa, the Marshalls, Midway, Leyte ... she screened and helped assist survivors when Lexington, Wasp, Hornet and Yorktown were sunk." On these recent expeditions, said Delgado, they "went deep, deep, deep inside some of the ships, Saratoga in particular, but also the sub Apogon."